What is the purpose of each process launched at startup on Ubuntu Server 16.04 x64? I launched a Digital Ocean droplet with Ubuntu Server. 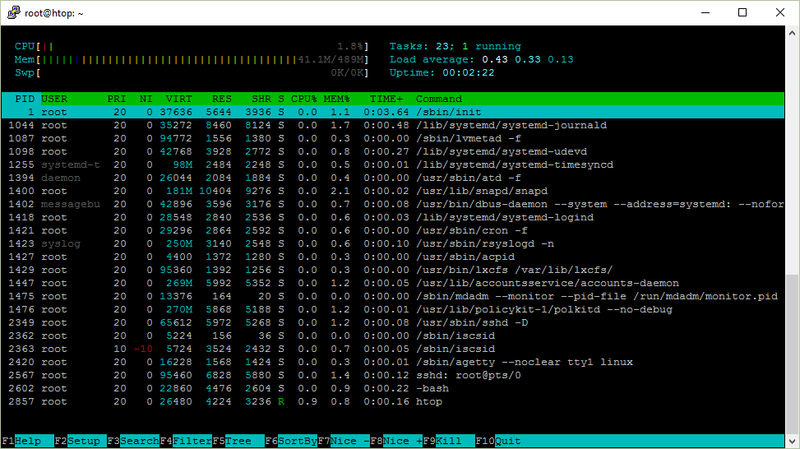 Then I installed htop to look at the currently running processes. I had no idea what half of them do. Do I even need them? Here are my research notes on the processes that are run at startup on a fresh Digital Ocean droplet with Ubuntu Server 16.04.1 LTS x64. When the init command starts, it becomes the parent or grandparent of all of the processes that start up automatically on the system. 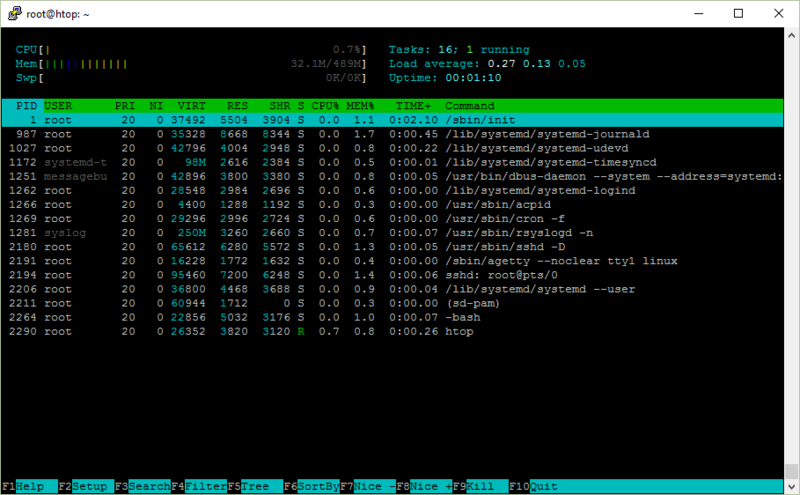 systemd-journald is a system service that collects and stores logging data. It creates and maintains structured, indexed journals based on logging information that is received from a variety of sources. One of the main changes in journald was to replace simple plain text log files with a special file format optimized for log messages. This file format allows system administrators to access relevant messages more efficiently. It also brings some of the power of database-driven centralized logging implementations to individual systems. You are supposed to use the journalctl command to query log files. It looks like it is not possible to remove or disable this service, you can only turn off logging. The lvmetad daemon caches LVM metadata, so that LVM commands can read metadata without scanning disks. Metadata caching can be an advantage because scanning disks is time consuming and may interfere with the normal work of the system and disks. But what is LVM (Logical Volume Management)? You can think of LVM as "dynamic partitions", meaning that you can create/resize/delete LVM "partitions" (they're called "Logical Volumes" in LVM-speak) from the command line while your Linux system is running: no need to reboot the system to make the kernel aware of the newly-created or resized partitions. It sounds like you should keep it if you are using LVM. systemd-udevd listens to kernel uevents. For every event, systemd-udevd executes matching instructions specified in udev rules. udev is a device manager for the Linux kernel. As the successor of devfsd and hotplug, udev primarily manages device nodes in the /dev directory. So this service manages /dev. I am not sure if I need it running on a virtual server. systemd-timesyncd is a system service that may be used to synchronize the local system clock with a remote Network Time Protocol server. atd - run jobs queued for later execution. atd runs jobs queued by at. Unlike cron, which schedules jobs that are repeated periodically, at runs a job at a specific time once. I've actually never used it until now. Developers from multiple Linux distributions and companies today announced collaboration on the “snap” universal Linux package format, enabling a single binary package to work perfectly and securely on any Linux desktop, server, cloud or device. Apparently it is a simplified deb package and you're supposted to bundle all dependencies in a single snap that you can distribute. I've never used snappy to deploy or distribute applications on servers. My understanding is that you need it for desktop environments but on a server to run web apps? I wonder what time it is and whether it is being synchronized with NTP? Oops. Should probably keep this. systemd-logind is a system service that manages user logins. -f Stay in foreground mode, don't daemonize. You can schedule tasks to run periodically with cron. Use crontab -e to edit the configuration for your user or on Ubuntu I tend to use the /etc/cron.hourly, /etc/cron.daily, etc. directories. You'll probably want to keep cron. Because otherwise when trying to remove it with apt remove cron it will try to install postfix! Rsyslogd is a system utility providing support for message logging. In another words, it's what populates log files in /var/log/ like /var/log/auth.log for authentication messages like SSH login attempts. The configuration files are in /etc/rsyslog.d. You can also configure rsyslogd to send log files to a remote server and implement centralized logging. You can use the logger command to log messages to /var/log/syslog in background scripts such as those that are run at boot. Right, but we already have systemd-journald running. Do we need rsyslogd as well? Rsyslog and Journal, the two logging applications present on your system, have several distinctive features that make them suitable for specific use cases. In many situations it is useful to combine their capabilities, for example to create structured messages and store them in a file database. A communication interface needed for this cooperation is provided by input and output modules on the side of Rsyslog and by the Journal's communication socket. So, maybe? I am going to keep it just in case. acpid is designed to notify user-space programs of ACPI events. acpid should be started during the system boot, and will run as a background process, by default. In computing, the Advanced Configuration and Power Interface (ACPI) specification provides an open standard that operating systems can use to perform discovery and configuration of computer hardware components, to perform power management by, for example, putting unused components to sleep, and to do status monitoring. But I'm on a virtual server that I don't intend to suspend/resume. I am going to remove it for fun and see what happens. I was able to successfully reboot the droplet but after halt Digital Ocean thought it was still on so I had to Power Off using the web interface. So I should probably keep this. Lxcfs is a fuse filesystem mainly designed for use by lxc containers. On a Ubuntu 15.04 system, it will be used by default to provide two things: first, a virtualized view of some /proc files; and secondly, filtered access to the host’s cgroup filesystems. In summary, on a 15.04 host, you can now create a container the usual way, lxc-create ... The resulting container will have “correct” results for uptime, top, etc. The AccountsService package provides a set of D-Bus interfaces for querying and manipulating user account information and an implementation of these interfaces based on the usermod(8), useradd(8) and userdel(8) commands. When I removed DBus it broke timedatectl, I wonder what removing this service will break. The name is derived from the md (multiple device) device nodes it administers or manages, and it replaced a previous utility mdctl. The original name was "Mirror Disk", but was changed as the functionality increased. RAID is a method of using multiple hard drives to act as one. There are two purposes of RAID: 1) Expand drive capacity: RAID 0. If you have 2 x 500 GB HDD then total space become 1 TB. 2) Prevent data loss in case of drive failure: For example RAID 1, RAID 5, RAID 6, and RAID 10. My understanding is that this is like fine-grained sudo. You can allow non privilegded users to do certain actions as root. For instance, reboot your computer when you're running Linux on a desktop computer. Still wondering if this breaks something. sshd (OpenSSH Daemon) is the daemon program for ssh. -D When this option is specified, sshd will not detach and does not become a daemon. This allows easy monitoring of sshd. In computing, iSCSI (Listeni/aɪˈskʌzi/ eye-skuz-ee) is an acronym for Internet Small Computer Systems Interface, an Internet Protocol (IP)-based storage networking standard for linking data storage facilities. By carrying SCSI commands over IP networks, iSCSI is used to facilitate data transfers over intranets and to manage storage over long distances. iSCSI can be used to transmit data over local area networks (LANs), wide area networks (WANs), or the Internet and can enable location-independent data storage and retrieval. The protocol allows clients (called initiators) to send SCSI commands (CDBs) to SCSI storage devices (targets) on remote servers. It is a storage area network (SAN) protocol, allowing organizations to consolidate storage into data center storage arrays while providing hosts (such as database and web servers) with the illusion of locally attached disks. getty, short for "get tty", is a Unix program running on a host computer that manages physical or virtual terminals (TTYs). When it detects a connection, it prompts for a username and runs the 'login' program to authenticate the user. Originally, on traditional Unix systems, getty handled connections to serial terminals (often Teletype machines) connected to a host computer. The tty part of the name stands for Teletype, but has come to mean any type of text terminal. This allows you to log in when you are physically at the server. 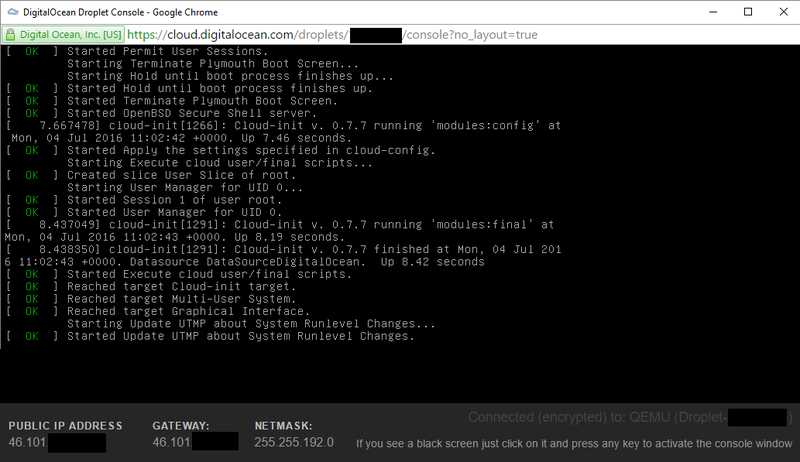 In Digital Ocean, you can click on Console in the droplet details and you will be able to interact with this terminal in your browser (it's a VNC connection I think). 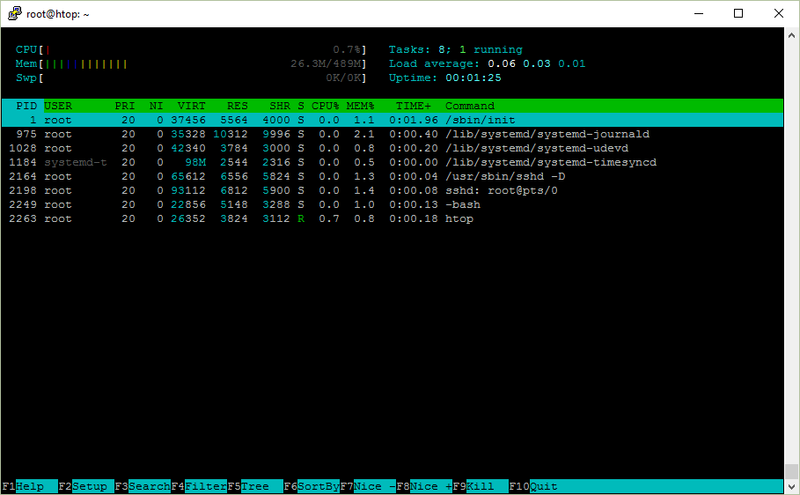 In the old days, you'd see a bunch of ttys started a system boot (configured in /etc/inittab), but nowadays they are spun up on demand by systemd. When I rebooted the server, I could still connect to it via SSH but I was no longer able to log in from the Digital Ocean web console. sshd: root@pts/0 means that there has been an SSH session established for the user root at the #0 pseudoterminal (pts). A pseudoterminal emulates a real text terminal. bash is the shell that I am using. There's a dash at the beginning because launching it as "-bash" will make it a login shell. A login shell is one whose first character of argument zero is a -, or one started with the --login option. This will then cause it to read a different set of configuration files. 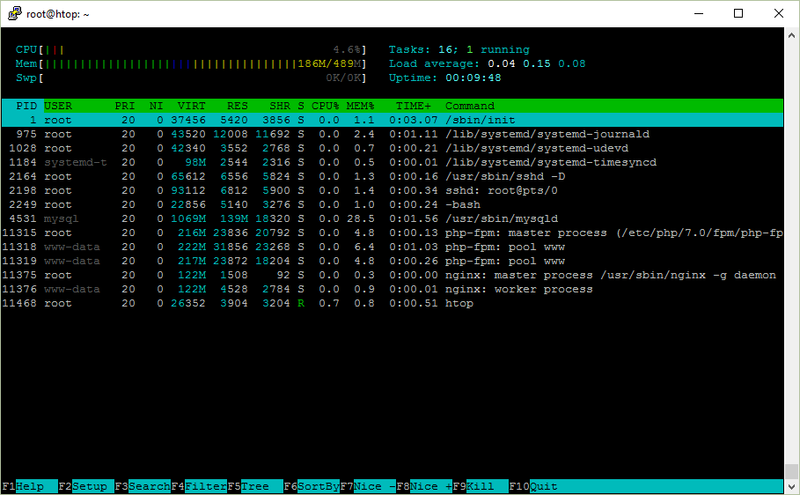 htop is an interactive process viewer tool that is running in the screenshot. I followed the instructions in my blog post about unattended installation of WordPress on Ubuntu Server and it works. Here's nginx, PHP7 and MySQL.